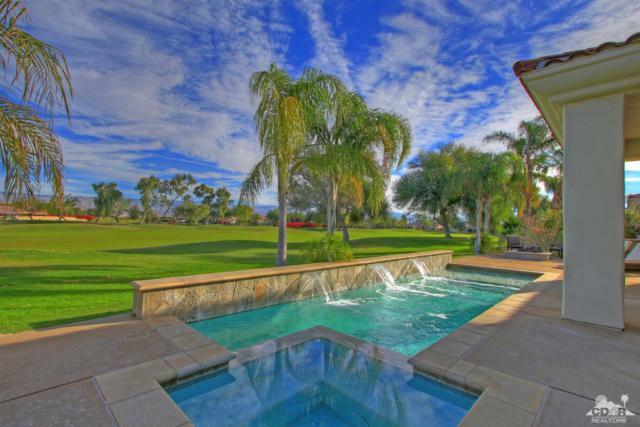 Mission Hills Legacy Oakhurst offers 126 acres of land surrounding the Dinah Shore Golf Course. All homes in this development have golf course frontage, which provides the elite country-club feel and style that many desire so deeply. Although the area was originally designed to have over 500 units of both attached and detached single family homes, the design was scaled back to allow for only a little more than 300 lots that all offer a quarter acre lot and a view of the golf course. Although there are fewer homes, they are more prestigious and elite than if there had been 500 built in this community. The homes were built and designed by Rancho Capistrano Development, and range in size from 2,000 to 3,000 square feet. The prices are quite modest for this type of luxurious living; homes start between $320,000 and $600,000 for the ultimate in desert living with a country club setting. Mission Hills Legacy Oakhurst homes feature 156 properties located on the fairway of the Pete Dye Challenge Golf Course. There are six different floor plans to choose from, ranging anywhere between 1,900 square feet up to nearly 4,000 square feet. There are two different home collections to choose from: the Classic Collection and the Vintage Collection. While the Vintage collection offers more square footage and a higher price tag, nothing will match the quality and design of any of these luxurious desert estates. The homes were built between 1997 and 2002, and all include $510 monthly Homeowner’s Association fee that includes a social fitness membership to the Mission Hills Country Club. The Mission Hills Legacy Oakhurst is an elite group of properties designed for those who want only the best of the best. This development features 11 homes that are styled in a “Lakefront” design, located on the Gary Player Golf course. All homes in this collection also have detached casitas, or guest houses. These homes range from 2,500 square feet to just under 3,000 square feet, and are located in the gated community of the Mission Hills Country Club. These homes offer some of the most luxurious designs and stunning views, and were built in 2003. Prices start just under $800,000, and the Homeowner’s fees are the same as the Legacy at Mission Hills Collection. The final Collection, Mission Hills Legacy Oakhurst, features 60 homes located on either the Pete Dye Golf Course or the Gary Player Course, and range in price from $799,000 to $1.6 million. Three different floor plans offer between 2,700 and 3,500 square feet of living space, all designed with luxurious living in mind. These homes were built between 2002 and 2004, and include the same Homeowner’s fees as the rest of the Legacy properties. All of these homes are situated on the Mission Hills Country Club, which was designed as the peak of luxury in the country club world. It was designed as a showcase club, and is well-known for its three world-class golf courses. If you are interested in a tour of one of these properties, or simply learning more about these homes, please contact us today. Our goal is to help you find the home of your dreams, and we’ll do whatever it takes. Call us now to set up an appointment. If you would like to see property at Mission Hills/Legacy-Oakhurst , please call us at the numbers below. Were committed to helping you find the home of your dreams.